Dassault Systèmes India would like to thank and express its gratitude to Mrs. Frédérique Vidal, French Minister of Higher Education, Research and Innovation, Mr. François Gautier, Consul General of France and several other dignitaries who graced the occasion and provided an opportunity to host you at our Bengaluru office. We would especially like to thank Mr. François Gautier for providing a short summary of the visit with us. Mrs. Frédérique Vidal, French Minister of Higher Education, Research, and Innovation, was in the official delegation of the French President’s first state visit to India scheduled from 9th to 12th March 2018. 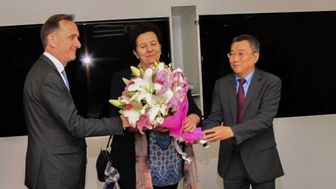 The Minister extended her visit in India by adding a day’s programme in Bangalore on 12th March 2018, with a high-level delegation comprising of the President of the French space agency CNES and Directors of the most prestigious French research institutions such as CNRS, ENS, INRA, IRD, and INSERM. The Minister’s visit offered an opportunity to strengthen various areas of the dynamic Indo-French bilateral partnership in the fields of her area of work, namely education, research, and innovation. These are all spheres declared as a priority by the highest executive leaders of both countries. In the course of her trip in Bangalore, the Minister visited the French company Dassault Systèmes in order to understand their several projects in innovation, namely the software they produce for various sectors ranging from aeronautics, space to life sciences and electric mobility. Her visit to Dassault Systèmes was a great opportunity for her and her delegation to learn more about the activities of this company and the rich variety of fields covered by 3DS. It also shows the importance of India in the global R&D scene, with the contribution of the 3Ds group worldwide. The entire delegation was grateful to 3DS for organizing such an insightful visit. Get FREE articles and news delivered to your email inbox! Powered by Dassault Systèmes India, we are in the 3D technology business to provide you the latest innovations in product design.